Mum and son beam as Down Syndrome boy invited to party. Her son was the only child not invited to the party, so she wrote the other parents this letter. The power of Facebook has once again been proven. This time, it’s made a little boy’s day by getting him invited to a party that he was allegedly excluded from because of his Down Syndrome. When Canadian mum Jennifer Kiss-Engele’s son Sawyer was not invited to a classmate’s birthday party – and appeared to be the only one of 22 students who was excluded – Ms Kiss-Engele took to Facebook to pen an open-letter to the child’s parent. “I know it’s not because your child and him don’t get along, he’s brought up your child’s name on several occasions. The mum-of-three goes on to say that she isn’t mad at the parent, but wants to educate them on what it means to have Down Syndrome. The post was viewed more than 6000 times and shared by almost 3000 Facebook users. Of the 930 comments, the majority were supportive of Ms Kiss-Engele and Sawyer. It would seem the parent of the unnamed child was one of the many people who saw this and got the message. Loud and clear. Because Ms Kiss-Engele wrote yesterday that the story has a "happy ending". 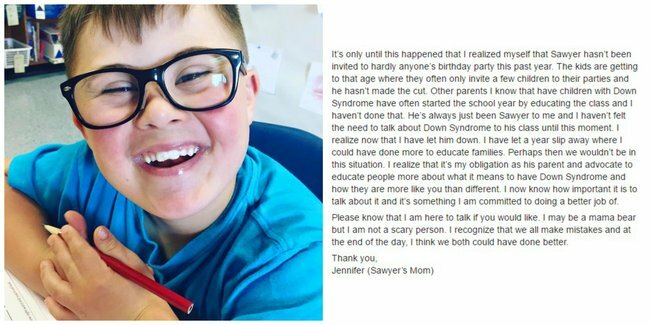 "The parent read my letter, spoke to their child about Sawyer, and the child created a special birthday invite for Sawyer." "Of course he&apos;s been beaming ever since and can&apos;t stop talking about it." Ms Kiss-Engele then shares that she is really proud the letter has been viewed by so many people because its not just her son that is affected by exclusions. "There are so many kids with special needs (and without of course) that just don&apos;t make the cut." "I think as parents we all need to do a better job of fostering these relationships, myself included. "I hope that parents who read this will help open that dialogue with their own child and perhaps make that one &apos;extra&apos; invitation."